Are you looking for recharging your Airtel Prepaid or Digital TV? 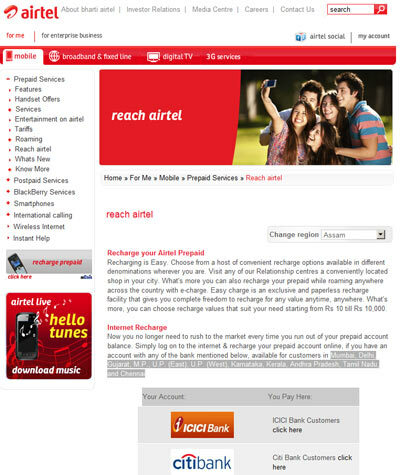 You can recharge your Airtel mobile in two ways. One is to recharge after logging into one of your bank accounts which support mobile recharge. The other is to pay at Airtel site. 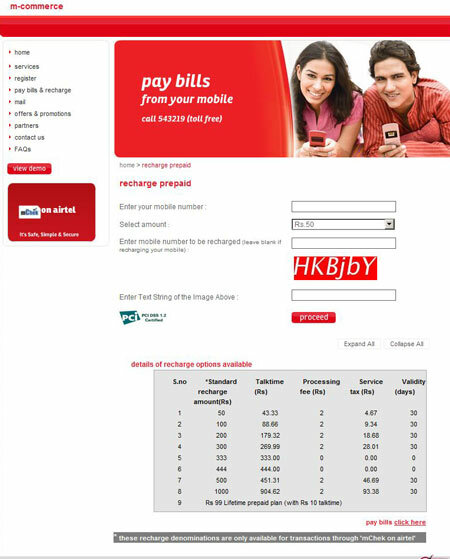 You can also pay thru your mobile, find the procedure at Airtel Mobile Customer Care. You can do online recharge for your prepaid connection here. If you are first time mCheck user then you'll be presented with this message: "You are a first time mChek user, please register using the PIN sent via SMS." Click the right arrow, you'll be shown a text box with message:"mChekPIN recvd by SMS:"
You can recharge your account in 3 different ways. If you have Airtel mobile connection and have registered with Airtel mCheck then you can recharge simply by sending SMS to toll free number: 543219. You can know more about registering at mCheck. Call Airtel DTH/DigitalTV Customer Care numbers, choose appropriate options to recharge. You can call the Airtel toll free number or the chargeable one. If you've already registered, at Airtel DigitalTV login, login with your id & password. Then click "Recharge" link on the left side of the page. You can pay here by your credit card or by savings bank account using Netbanking. All major banks: SBI, HDFC, UBI, Kotak, BoB, BOI, IndusInd, IDBI, PNB, Axis bank and some mores are supported.